Downsizing your home is a major endeavor, no matter what the circumstances. When the moving day has come with all the packing, unpacking, loading, and unloading it most certainly can overwhelm the best of us. However, moving to a smaller home into a 55+ Community is becoming a more popular choice among homeowners. According to MarketWatch research, in 2017, 60 percent of people living in homes of 2,000 square feet or more indicated they would seek a smaller property the next time they moved. For whatever the reason, an increasing number of Baby Boomers are willing to give up some extra square footage for greater quality and functionality in their new homes. If you are moving into a smaller home, as many people tend to do, then it can be said you are downsizing your home. Here are six tips you should follow when downsizing your home. 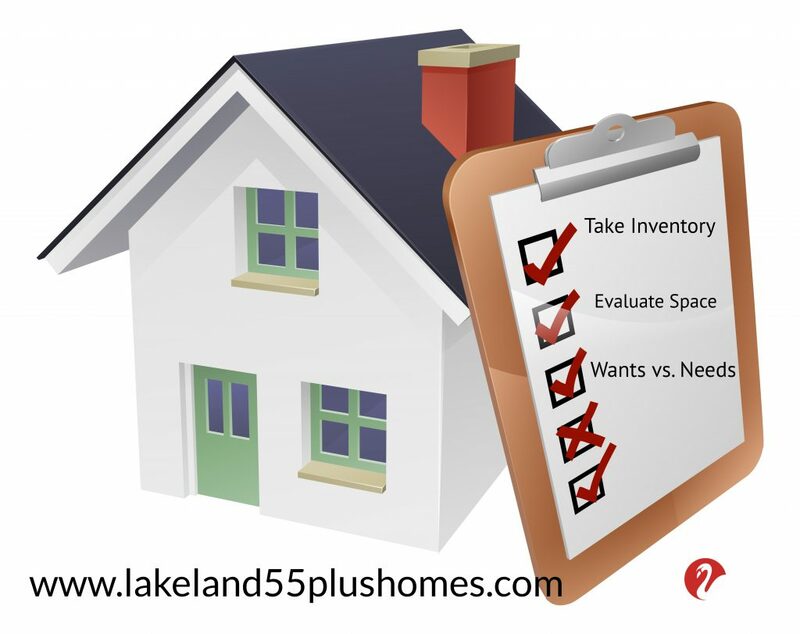 Take Inventory: Although this should be part of any move, it is especially important when downsizing your home. Go through your belongings and decide what you want to keep, throw away, donate or attempt to sell. Sorting through everything you own may seem like a monumental task—and for many households, it is. Try the divide-and-conquer approach: tackle one room or zone of your home at a time. Taking this approach, and spreading your task over several days, also allows you to work at your own pace and help you feel less overwhelmed. Wants vs. Needs: It is important to know the difference between wants and needs. In the end, it is quite likely that all your belongings will not fit in your new, smaller home. Your attachment to many of the things in your home is not about the things themselves, but rather the memories associated with them. When it comes to treasured but unnecessary belongings, consider sending them to family and friends, who also have an attachment to the items. Other times items in your home are bulky and unnecessary, for instance, a large desk could be replaced with a couple of built-in shelves. Avoid Duplicates: After taking inventory of all of your belongings, you will become aware of what you have multiples of, and can identify favorites. In many cases, your kitchen is a common locale for duplicate items. Whether it be too many spatulas, or having more sets of plates, glasses, and silverware than you need, now is the time to get rid of the extras. Be sure to sort through your pantry and spice cabinet as well. Remove any items that have passed their expiration date or that you simply do not use anymore. Make The Most Of Your Space: Moving to a smaller home means you have to make the best use of space that you can. This means being creative with your organization efforts. Perhaps buy some hanging shoe racks, ottomans with interior compartments, sliding bins that go underneath your bed, or built-in shelves. Clear plastic containers are a great choice as they allow you to see into them easily and identify items you have stored. Make Money: If you have to get rid of extra items, you may as well make a little bit of money in the process! Have a yard sale, or list belongings with online sites like eBay, LetGo, Facebook Marketplace or Craigslist. Remember, even items that may seem useless could have value for someone else. After all, one man’s trash is another man’s treasure. Take Measurements: Before moving into your new, smaller home, you will need to know the amount of space you will be working with. First and foremost, you need to check if your current furniture will fit into your new home. Measuring your current belongings, such as beds and furniture, will help you have an early insight on how to lay out your new home. It will also help you know what you can take with you and what you cannot. We understand that moving to a new home is stressful. Add that to the fact that you will be downsizing your home, and especially high levels of stress can occur. If you find yourself experiencing large amounts of stress, it will benefit you to think of why you wanted to move into a smaller home to begin with. Take a deep breath and go through the tips listed above and also make a checklist. This will help you come to terms with your possessions, and have more control going forward. There are also several financial and lifestyle benefits that come with downsizing your home. One great benefit is there is less area to clean and maintain! Your utility bills often are lower too, because it requires less energy to heat and cool a smaller home. Mortgage payments, property taxes, and homeowner’s insurance premiums also may be lower. Many Americans, especially empty-nesters, those who have retired, or are approaching retirement age, have the desire to move to a smaller space where there is less to manage. We service the following Central Florida areas: Lakeland, Auburndale, Mulberry, Winter Haven, Bartow, Plant City, Seffner, Valrico, Polk City, Lake Alfred, Lake Wales, Haines City, and Davenport FL.